TDIPT presents "Christmas in July"
Please join us in celebrating "Christmas in July" at the TDIPT Mercantile beginning on July 1st and 15th for some wonderful Holiday creations from the artists! Thanks for stopping by and joining in my celebration in honor of America's Birthday. I have another giveaway as well as some Americana items for sale. I have been busy stitching, punching and sewing this week so scroll on down and take a look! 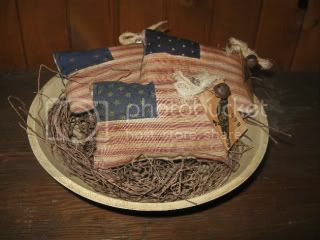 Be the first purchase made for my 4th of July items and you get this little Flag ditt bag. I cross stitched a tiny flag and "usa" onto a coffee dyed counted thread swatch, frayed the edges and ran a cranberry running stitch to attach it to the coffee dyed bag. 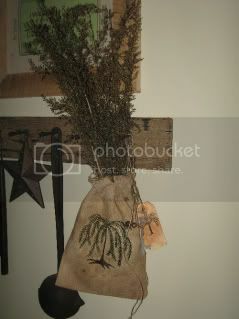 I ran a piece of cranberry ribbon through the bag for the draw string and then put in a small bundle of Sweet Annie. The little bag measures 5 1/2"x 5 1/2". It will come signed, dated and copyright 2009 on a tag I slipped inside the bag. 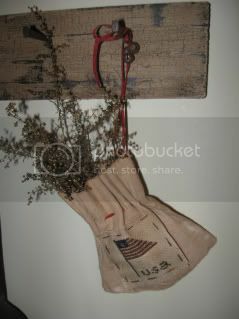 Looks cute hanging off a nail or hook for a touch of Americana in your home. I have had this red and white ticking for some time now and thought it would make such cute little bowl filler pillows. I sewed up 3 of them, each one has a different blue and star swatch in the corner and all three are backed with a navy flannel. 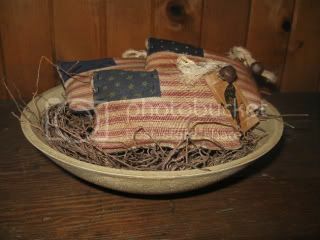 I stuffed them each with crushed walnut shells for a nice heavier feel and then stained them up and attached an aged "usa" crow hang tag by rusty bells and rusty safety pins tied with pieces of dyed cheese cloth. The next part I think you'll like, I did the shopping for you and this wonderful bowl is included! I found it at a my favorite primitive shop. It is an off white crackled bowl and measures about 9". Also while I was at the shop I came across this really neat vine. Its called Angel Hair Vine and I had never seen it before and I snatched it up. I just love it! The little pillows measure a tiny 4 1/2" wide x 2 1/2" long. Now for once I can say bowl and vine included and not just for display. I think you will easily find a spot for this charming Americana arrangement! Cost is for the set $34.00 includes USPS priority mail. I have another ditty bag I stitched up, but this one is a Patriotic bag for your holiday decorating, hang it up a knob, nail or hook. I aged up some flour sack cloth with coffee and stitched a flag, crow and 1776 on the front of it. 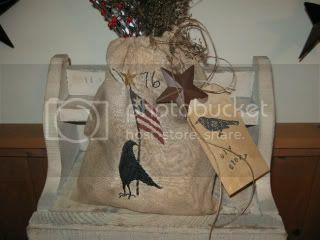 There is an aged drawstring to gather up the bag along with an "old glory" and crow hang tag. A cranberry metal star are also attached by a rusty safety pin. I then stuffed it with some muslin to give it some fullness at the bottom. To finish off the bag I have included red, white and blue berries and a small sprig of Sweet Annie. The bag measures 7" wide x 8 1/2" long and will be signed, dated and copyright 2009 on a tag I stuck inside the bag. Cost is $26.00 which includes USPS priority mail. I have needle punched a longer primitive style flag with a single star using 4 strands of dmc floss onto weavers cloth. 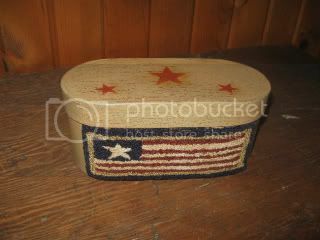 It was dyed up with coffee and then attached to the front of this oval paper mache box using an acid free glue. The box is crackled and has a nice mellow old yellow to it. I can't take credit for the box, I purchased it at one of my favorite prim shops. 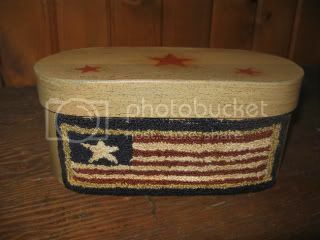 I did however stencil 3 barn red stars to the lid to accent the red in the flag. The box measures 8" wide x 3 1/2" tall and 3 1/2" deep. Just a darling little box to set out for the 4th or tuck in cupboard and leave it out all year. The bottom of the box will be signed, dated and copyright 2009. Here's my giveaway! A charming small black, white and cream journal. This was fun making up! I used a paper mache notebook and covered it with a wonderful black, white and cream slightly embossed scrap booking paper. 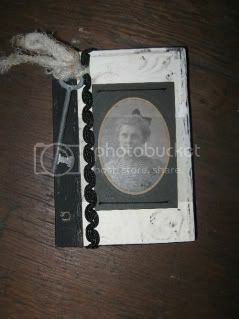 I attached an old photograph of woman on the front, I punched 4 holes into the book and picture and ran black floss through it and tied it on the inside. I looped a black ribbon around the binding of the book and attached an old skeleton key (its an antique one) with coffee dyed cheese cloth to the ribbon. The journal measures 4"x6" Just a cute little decorating accent for your home from me to you. It's been WON! Fooled ya! You'll have to scan down to see the black, white and cream pieces. 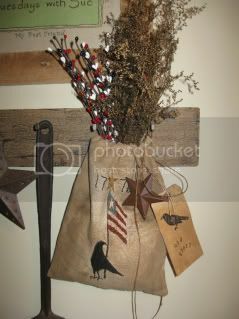 I had a few requests for more of these ditty bags, so here is another. Note: I am still in search for more of these old linen towels that I am using for these(so check back often if you are too late for this one). 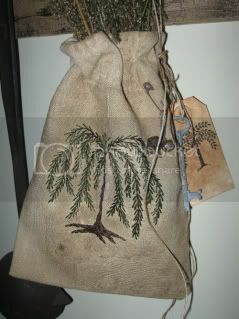 Anyways, this ditty bag has a willow tree hand stitched on to it. It is an old piece of linen dish toweling with small tears in it and then I grunged it up with coffee. I made a drawstring slot and slid in a dyed piece of roping that's nice and long. I attached 2 rusty bells by a rusty safety pin and also a willow tree hang tag also attached by a rusty pin. Also is an antique skeleton key. I put a generous bundle of fragrant sweet annie into the sack. The sack measures 7"x8". Looks so cute dangling from a nail or hook. This little pinkeep was cross stitched on 14 count thread fiddlers cloth. I have 2 folky little birds, 2 willow trees, the year 1803 and a black bow. I attached a black cord style ribbon by two rusty safety pins and tied them in a bow for hanging, I like how the black bow compliments the black cross stitched bow. 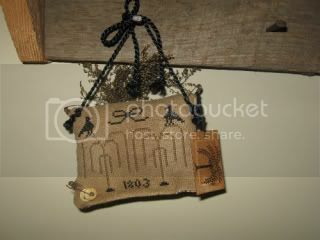 I also attached a willow tree hang tag and 2 cream buttons. Everything can be detached if desired. 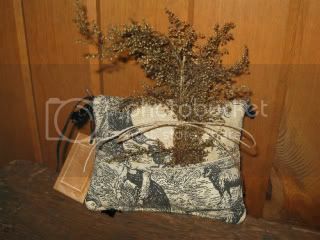 On the back I used toile fabric and I have a little sewn pocket that I put a little tied sprig of sweet annie into. The entire pinkeep was dyed with coffee and stuffed with snipets of fabric and some crushed walnut shells. A sweet piece to hang on a hook or remove the ribbon and use for your pins or can even be used as a bowl filler. It will come signed, dated and copyright 2009 by me on a tag I slipped into the pocket. 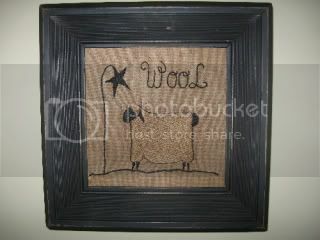 This sweet small sheep with a Shepherds Hook style hanging star is great for the sheep lover! It simply says "Wool" and of course was stitched in black, white and cream! My stitching was done on coffee dyed osnaburg and I used a black distressed deeper set small frame. The measurements are about 9"x9", there is glass and a sawtooth hanger. A plain and simple piece for a primitive sheep lover!